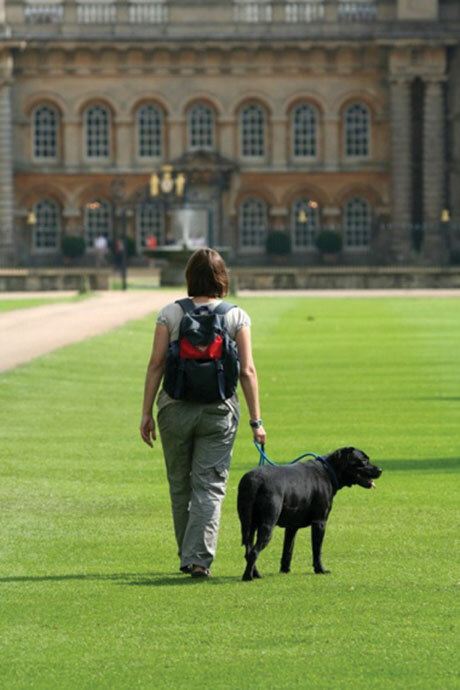 Dogs are welcome at Grimsthorpe. There are plenty of places to walk your dog (on a lead please). We do ask that you avoid the formal gardens and children’s adventure playground, but that still leaves hundreds of acres to explore. Under no circumstances should you take your dog into any areas where there are cattle. The Tearoom, Shop and the Castle are off limits to all dogs except guide dogs. By cleaning up after your dog you will also ensure that other visitors’ enjoyment of the park is not spoilt. If you can’t find the dog water bowl outside the Shop just ask and we’ll point you in the right direction. Dog walking is a regular sight in the park and we are delighted that people and their dogs can enjoy the open space but it is important that dogs don’t disturb small birds and mammals and that is the main reason we ask owners to keep dogs on leads. If you are cycling it also makes sense to leave the dog at home. We don’t encourage dogs being locked in cars and would summon help from the RSPCA if we considered that a dog was in distress. Regular dog walkers might want to consider buying a Season Ticket to the park.